If music were truly neutral, I would expect the drug addict to listen to Amazing Grace as often as Def Leppard. The un-regenerated chooses Def Leppard because it has relevance for him. Experience tells me that the drug addict will choose music that validates his culture over that which contradicts. In this newer book (published in 2006) concerning worship music, Jones clearly defines why we must proceed carefully in choosing music, the musicians, and the presentation of our music worship service in order to validate biblical principles. Jones is organist and music director at Tenth Presbyterian Church in Philadelphia. His position on church music would anger many congregations, many evangelical no-name groups who gather under the pretense of church and the like. Why? Because he claims quite clearly that music is anything but neutral and, for that reason, must be carefully considered and guarded by the local congregation. “It is important to have a theology of worship music based on Scripture” (p. xii). “Music (in some churches), in particular, appears separate from elements of worship that seem to be more spiritual, such as praying and preaching. This worship dichotomy does not appear in Scripture” (p. 3). The argument that composers of old (Luther, Bach, Mendelssohn) were not Christian or sacred in their composing of worship music is refuted effectively by Jones. In chapter 3, he asks the reader to consider “For whom are you clapping”? In most cases, not for a biblical inspiration but rather for the performance or performer. In chapter 7, Jones deals with authenticity in worship music. 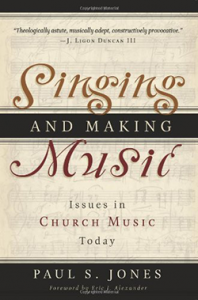 He clearly takes the position (and practice in his church) that outside music, whether recorded or hired in, is “hiring an agency to worship in our stead” (p. 51). Jones is also clear that the musicians who record the CD’s, or who are hired to come in for special occasions, often have little in common with the congregation they have been hired by. As a long time church musician, I have always stated my position that the music on the platform ought to be protected as carefully as the pulpit itself. What preacher, if handed a stack of notes by a church member ten minutes before his sermon, would agree to preach from those notes, sight unseen or biblically researched? Such is the dilemma I have faced when a piece of music is handed to me for the impending service ten minutes before. Or how often has a church musician been asked to step aside for a “walk-in” visitor, a non-member, who is invited to perform? These obvious problems are clearly addressed. “In the past decades we have witnessed the downward spiral of principle and excellence in church music whereby musical integrity has been abandoned more often out of ignorance than intention. Pragmatism, relativism, narcissism, and pop culture have invaded the church subtly masked as stewardship, progressive thinking, and cultural relevance. We are generally unaware of their presence. Much of this has come into play through the Contemporary Christian Music movement, which irrespective of taste, cannot be categorically separated from the secular forces and mediocre musical ideals that inform it… The primary problems in CCM stem from the pop philosophy that propels and undergirds it. This philosophy is consumerism.” (p. 199-200).